Since we live and work in an increasingly global marketplace, talent professionals are facing a new challenge – discovering a universal method to hire, promote, and develop talent from different countries and different cultures. Skills and knowledge – a.k.a. the education and experience sections you’d find on a resume – aren't going to cut it anymore. But talent assessments (which can quantify “soft skills” like innovation, communication, and adaptability) are an appealing alternative, since where someone went to school or what companies they've worked for in the past require more cultural context than whether someone is an innate problem solver or team player. If inclusivity across international borders is a priority for your organization, finding a talent assessment that can support multiple languages is crucial. Talent assessments bring a lot of benefits to organizations, one of the most significant being the implementation of a universal talent dataset, which consists of predictive people data that can be leveraged in every business unit. This kind of dataset goes beyond the standard KPI’s that HR departments currently collect, like absenteeism or time to hire. Although this data measures success within the HR department, these metrics don’t deliver business critical insights that have significant impact on the overall organization’s performance. Talent assessments – which measure recurring patterns of thought, feeling or behavior like innovation, teamwork, adaptation, and communication – offer truly universal data that transcend geographical locations. If you have offices across the globe, you know that the criteria that translate to on-the-job success differ from country to country. Degrees and certifications that are useful for a job in one country may not exist in another country. The standard for writing resumes in North American countries may differ from the standard in other continents across the globe. Borders are beginning to blur as remote work becomes increasingly popularized, which means you will increasingly be forced to compare applicants from different countries for a single job. The cultural divide when it comes to resume standards and education and experience availability can make comparing the resumes of equally qualified candidates feel like comparing apples to oranges. Talent assessments have the potential to close this gap by providing a more objective and universal dataset to compare the potential of international job applicants and employees. When making talent management decisions across offices, it’s imperative that every location is collecting the same data from its people in order to make predictive and comparable talent decisions. Purchasing an assessment that supports the widely-spoken languages of these various offices is non-negotiable. Whether or not your organization has international offices, a talent acquisition process supported by multiple languages provides a universal dataset that is invaluable. As remote work becomes more commonplace, multilingual talent assessments can empower your organization to source your talent internationally, while still allowing job applicants to complete a psychometric assessment in their first language. Even when you’re not sourcing talent internationally, assessments that support many languages are becoming increasingly critical to providing a positive candidate experience for your locally sourced talent, too. After all, the immigrant population in the U.S increased by 29.2 million people between 1980 and 2015, and now one in five U.S. residents speak a language other than English in their homes. By providing a talent assessment where applicants may leverage the language they are most fluent in, your employer brand demonstrates its commitment to diversity and inclusion. By providing a talent assessment where applicants may leverage the language they are most fluent in, your employer brand demonstrates its commitment to diversity and inclusion. After all, studies show that organizations in the top quartile for racial and ethnic diversity are 35 percent more likely to have financial returns above their respective industry medians. When an organization has a more diverse workforce, they are better suited to address a diverse and global marketplace. 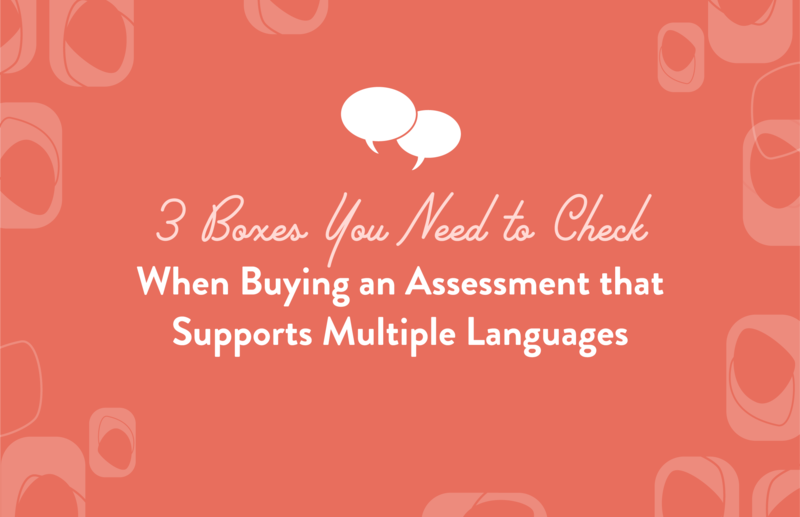 Now that you have a better understanding of the benefits that come with a multilingual assessment – whether your offices are located across the globe or not – let's dig into the 3 items you need to be on the lookout for when shopping for a talent assessment. 1. Is what’s being measured relevant across different cultures? If you have international offices or if you’re hiring a remote worker from a different country, it’s important to select an assessment that not only supports multiple languages, but also provides consistent results across cultures. Assessments, when not validated properly, run the risk of producing different results in different cultural contexts. Cognitive ability and the Five-Factor (“Big 5”) personality framework are excellent examples of what to assess for. Not only have they been scientifically validated to predict on-the-job success more accurately than a resume, but they have also been found to be consistent across cultures. When you’re looking for an assessment that ensures the best candidates won’t be lost in translation, be on the lookout for assessments that quantify cognitive ability and Big 5 personality traits. It’s important to also put yourself in the shoes of someone who does not live in the same cultural context as you and what barriers that cultural divide may surface when an individual takes that assessment. For instance, some personality tests require someone to view a picture and select if it is “like you” or “not like you.” Let’s say one of the pictures presented was of a cowboy. Would someone outside of North America wholly understand the symbolism behind the picture – an image of American masculinity, a vigilante, a hero, etc.? It’s certainly possible – John Wayne movies haven’t been watched by an exclusively American audience, after all – but the cultural context may not be as wholly understood or well-rounded, which could potentially skew results when compared to an American sample. In any case, always ask assessment providers for a technical manual. This is a handy document that all online assessment vendors should provide, as it outlines important research around the assessment’s validity and whether there is evidence to show adverse impact on certain groups of people. 2. How was the assessment translated? 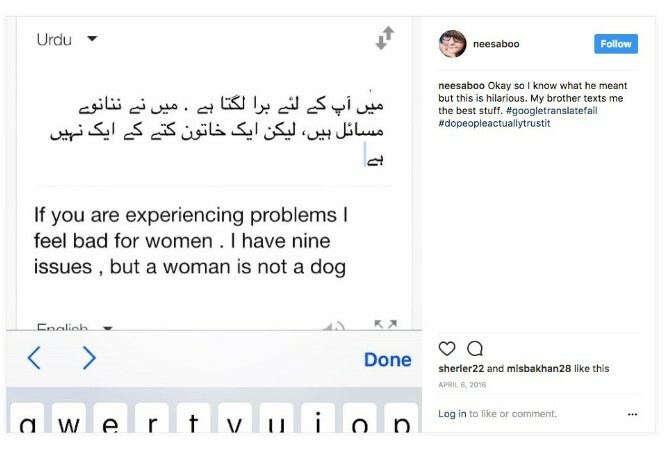 It’s no secret that Google Translate isn’t perfect, and I’m sure we’ve all come across “Google Translate Fail” articles when we should’ve been doing something more productive (off-topic, but here’s one of our favorites). If we can’t trust Google to translate Jay-Z, then we certainly can’t trust it to translate intentionally-written psychometric questions. When purchasing a talent assessment that supports multiple languages, ensure that human translators are the ones translating every string in the platform with care. Human translators can use their judgement to translate idioms or other culturally-specific phrases into sentences that make sense in the native language. When purchasing a talent assessment that supports multiple languages, ensure that human translators are the ones translating every string in the platform with care. 3. Does the assessment provide a great candidate experience for everyone? If candidate experience is important to your organization (and it should be, considering that candidate experience has a distinct ROI), then you’ll want to ensure that your talent assessment provides a positive candidate experience to everyone. If you’re wondering whether your talent assessment provides a positive candidate experience, ask yourself, “Does this assessment provide value for applicants?” So many assessments just leave candidates with a “we’ll be in touch” landing page – a black hole. It’s a frustrating experience for job seekers and employees, who have spent time and energy completing the assessment without receiving any value from the experience. Part of providing value for your candidates is ensuring that your talent assessment is automatically translated to the individual’s language of choice based on their browser settings. If applicants need to search high and low – or even if they just need to click a few extra buttons – in order to convert the assessment into the language they are most proficient in, they are less likely to even start the assessment, risking applicants churning with a sour taste in their mouth. Is what’s being measured relevant across different cultures? How was the assessment translated? Does the assessment provide a great candidate experience for everyone? If you’re looking to leverage a talent assessment to help your organization make more predictive talent acquisition and talent management decisions, digging deeper to ensure that the assessment can properly support multiple languages is worth the time. Whether you have global offices or not, talent assessments provide a universal dataset that transcends geographic locations and cultural divides, allowing you to hire and move talent predictively. Not to mention, when an applicant or employee can complete an assessment in their first language, it provides a positive and inclusive experience.